Yes, after 2 long years we’re finally playing a show again. And even better (for us), it’s in our hometown. When we heard rumors about our favorite pub closing down, we thought it was time to get out of our recluse. 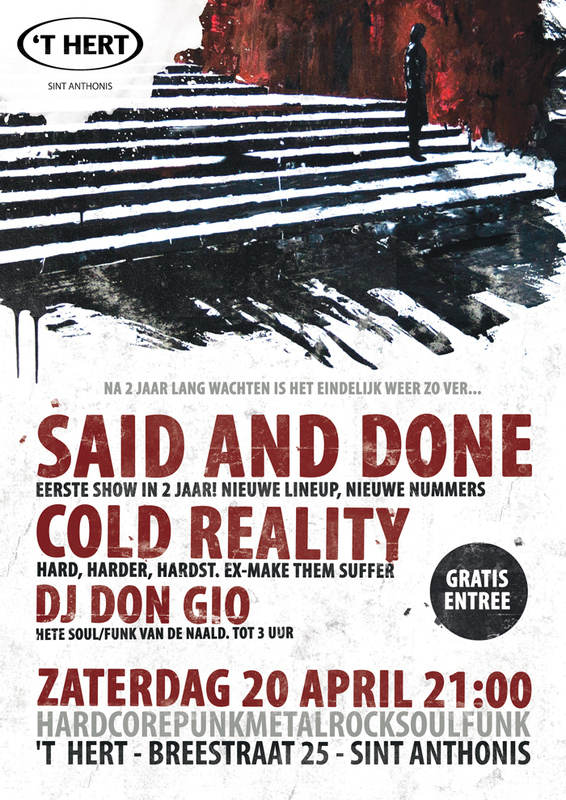 Like previous shows at ‘t Hert, we asked our buddies in Cold Reality (formerly known as Make Them Suffer) to come along. And this time DJ Don Gio (who used to play in No Turning Back a long, long time ago) will be making sure your ears don’t bleed out by spinning great soul and funk tracks in between the bands. Oh and yes, of course we’re still working on that record. But since music and vocals are pretty much done, we’re ready to play shows again. Posted on April 11, 2013 at 20:23. Bookmark the permalink.